The Field is a recently opened restaurant in London Fields with a focus on veggie and vegan food but also catering for the carnivores. Their menu is a three or five course plant based menu which they change every week. The concept is that you can enjoy the menu as a vegan, or if you fancy a bit of meat or fish it can be added on to specific courses. The restaurant is modern and spacious with an open plan kitchen and bar providing a chic edge. The atmosphere is great, with music and friendly staff making you feel at ease and relaxed throughout. 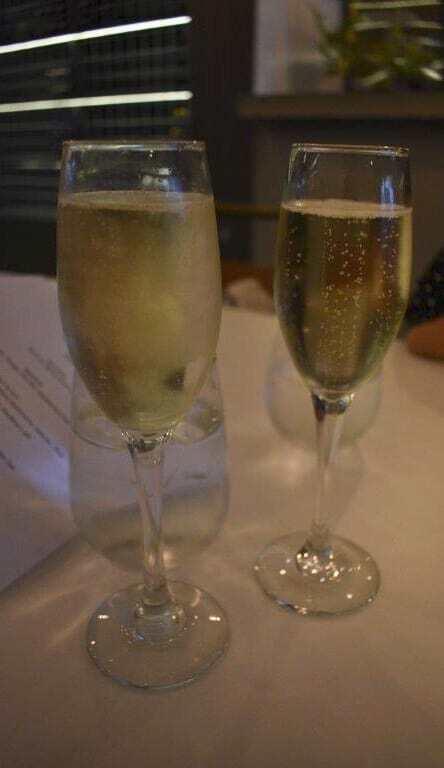 We sampled their current five course menu along with a glass of vegan prosecco and we were really impressed. 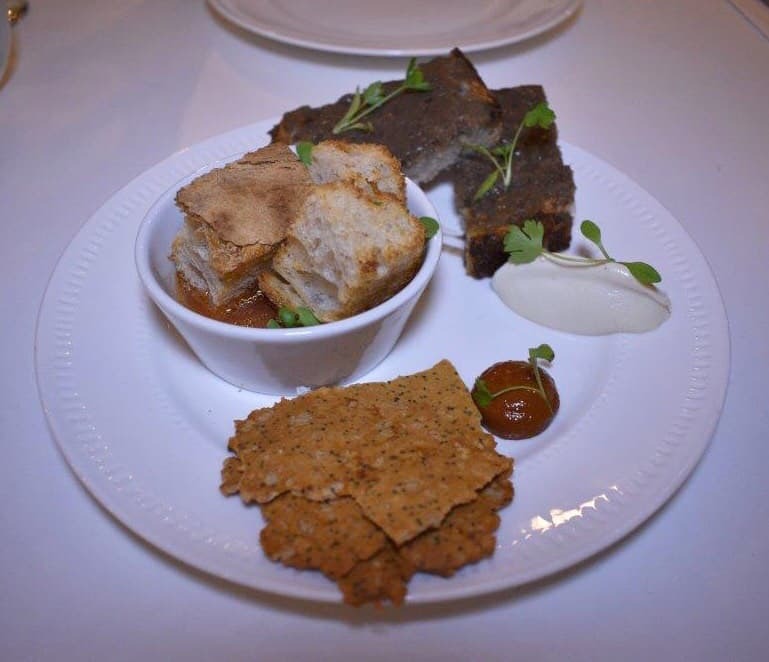 Before beginning our five courses we had some delicious nibbles of toasted bread with a tomato water, mushroom pate, a creamy cashew based sauce and a harissa sauce. The bread was delicious and all of the toppings were full of flavour, especially the tomato water which surprised us! 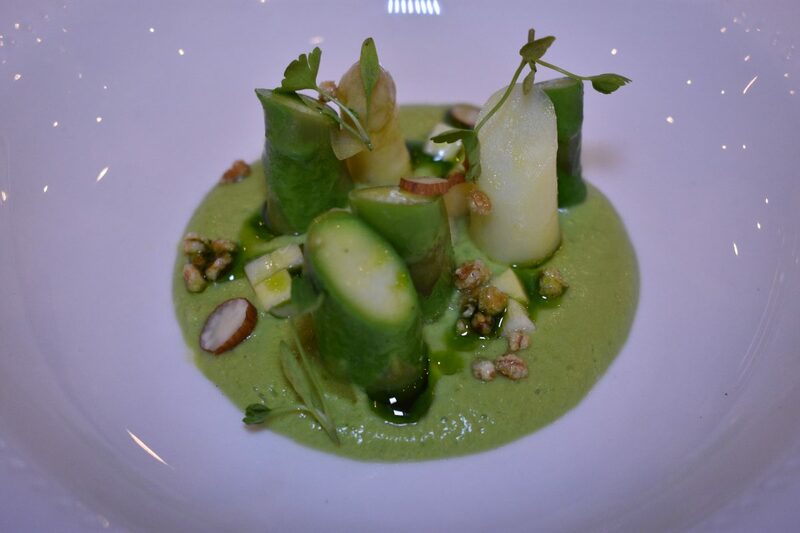 For our first course we had ‘Asparagus’ : an asparagus velouté base topped with green and white asparagus which were cooked to perfection. The velouté was smooth and silky and full of flavour with the addition of almonds and puffed spelt. It certainly was a celebration of asparagus. Next up was‘Agnolotti’:a mushroom and cavalo nero stuffed ravioli pasta, topped with toasted pine nuts and a creamy cashew based sauce. It was absolutely delicious. It is rare to get vegan ravioli and this was really something special. The pasta was al dente and the filling was rich and flavoursome. Course number three was‘Surf & Turf’: which was a roasted piece of celeriac coated in an olive and mushroom crumb and accompanied by a selection of seaweed, sea purslane, mushrooms and sitting in a mushroom broth. The celeriac was cooked well and the crumb gave it a hit of rich flavour. The seaweed and purslane gave the dish a strong salty flavour which complemented the earthy celeriac. 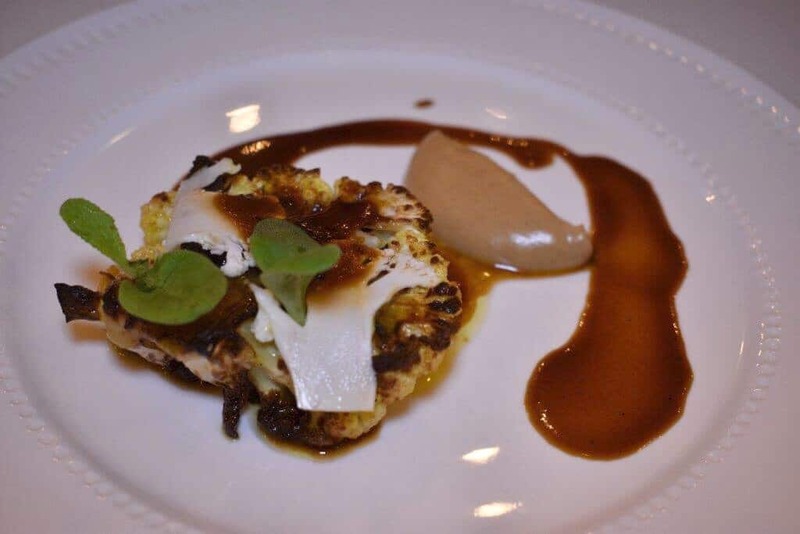 Course number four was ‘Roasted Cauliflower’:which was simply a delicious roasted cauliflower! It was accompanied by pickled cauliflower, a creamy sauce and a gravy like sauce which was packed with flavour. The cauliflower was charred and cooked just right, it was really delicious. 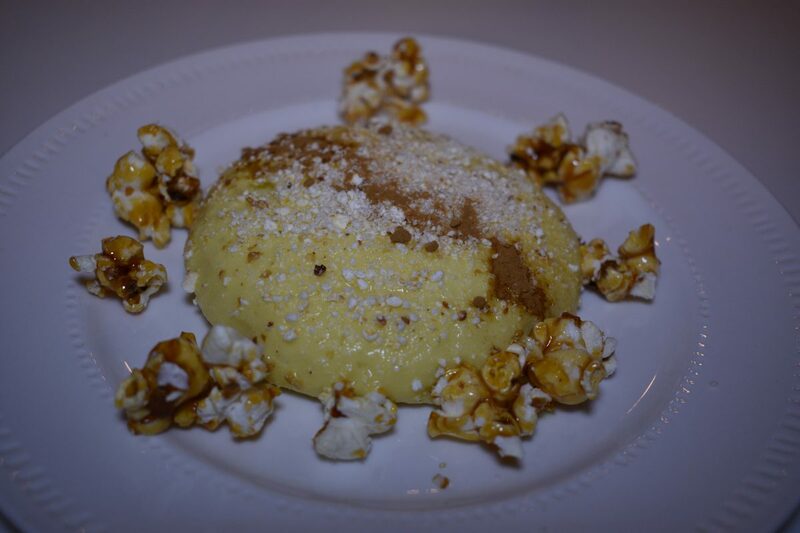 Our final course was the ‘Sweet corn and lions mane tart’. This tart had a shortcake base and was topped with a light creamy velouté made from sweetcorn. It had a sweet custard-like taste and texture and only a hint of the sweetcorn flavour. It was also topped with lions mane powder which is an earthy mushroom – together it made an interesting combination. On the side were moreish caramel popcorn pieces which were sticky and sweet. The three course menu costs just £26 and the five course is £32 which is fantastic value for money. The menu we sampled was unique and the food was really impressive – there wasn’t any need for us to add anything. 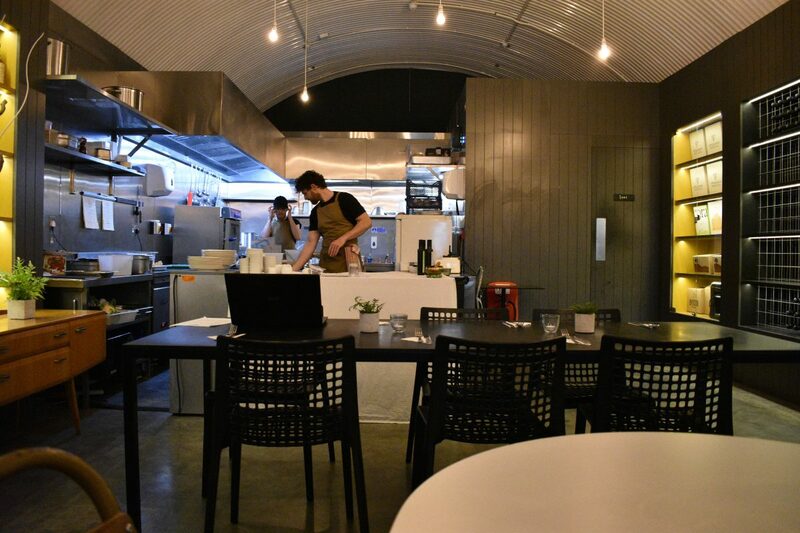 With high quality fresh ingredients being cooked by chefs who want to celebrate local produce, we loved this restaurant in London Fields. Nik and Ryan’s concept is unique and well executed. I would certainly recommend for veggies and non veggies alike!